Haywire Custom Guitars Shop - Need New Guitar Frets? Most guitar players really don’t give a lot of thought to the frets, though it can influence both tone and playability. Instead, most players will view the frets as an integral part of a guitar’s fingerboard. If a guitar has a smooth, playable neck that allows you to bend notes, do hammer-on and pull-offs and deliver clean articulations at all positions up and down the neck, it means that the frets have been perfectly matched and properly “dressed” to provide the best overall action. We offer only quality fret wire drawn from the finest 18% hard nickel/silver to give long life with steel strings. The composition of this fret wire, while called “nickel/silver”, contains no silver at all. The ingredients are brass and nickel. Apparently, 18% nickel is sufficient to make brass look silver! For general reference we use Dunlop’s fret numbers. In some cases where it is not reasonable to replace the whole neck it could be that a partial or a full re-fret of the entire neck is necessary. If this is the case or if it is what you prefer, then our Haywire Custom Shop re-fret option is available for just $10 per fret. You can decide or ask for our recommendation to determine if this option is required on your guitar neck. Fret size has a great deal to do with the action of your guitar. Low frets put your fingertips right on the fingerboard with little room to squeeze the strings out of tune or to get under them for bending. Tall frets are the opposite. 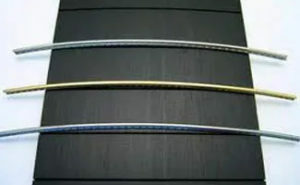 The width of the fret determines the amount of wear that can be expected before levelling and re-crowning is necessary. Wider frets wear longer. Narrow frets wear faster. Choosing a fret size is best done by experience. Do you like the feel of your present neck? Would you like more height or less height ? Which is best for you ?